Thanks for this, Peter. It's a sticky wicket, and it makes a difficult job even harder for the rest of us. As a ghostwriter who co-authors high profile memoirs, I begin every project with stern words to my client about the importance of telling the truth and the futility of thinking they'll get away with a lie. I do my utmost to shore up the story with media and other corroboration, and if I find that the client has lied, I don't hesitate to slap some mama says upside his or her head. So, yes, as an author, I do feel a huge responsibility to do everything I can to ensure the integrity of the book. But I'm not a journalist; I'm something between a sign language interpreter and the Ghost of Christmas Past. I have a duty to present my client's story as s/he wants it told, and -- as with any book -- my perspective on the material is coming from inside the appendectomy after a while. I appreciate having my feet held to the fire by a vigilant editor and copy editor. I almost always get that support, but on one occasion several years ago, I went to my editor (and this was at a highbrow house where literary values were much blustered about) with the inconvenient truth that they'd given my client a sizable advance for a hot steamy pile of BS. My editor told me I was "over-parsing" the facts and needed to understand the idea of artistic license. I flew home from NY to find an email telling me I was fired. For reasons I'm not privy to, the book never made it to publication, but at least two other writers were hired and fired after me in an attempt to make that doodoo bird fly. Maybe the publisher can arguably eschew legal responsibility in the aftermath of this Hiroshima kind of thing, but at the very least, they should be there on the front end, asking the hard questions. 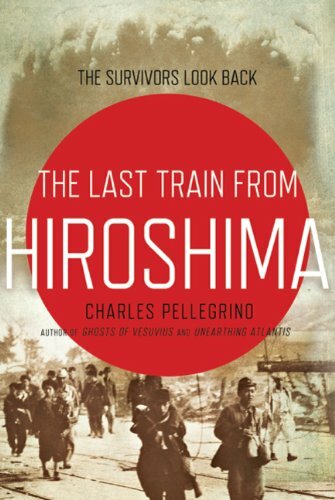 I notice that Charles Pellegrino is a regular associate of James Cameron, who is (still) planning to make a film about Hiroshima. Is part of the problem that the book business is getting more like the movie business – that a "property" is either a blockbuster or a flop, rather than the neat meshing of writer with readership that publishers used to manage so well? The temptation to salt the mine intensifies if the author's prospect is either bestseller or pulp. Sadly, the Mouth of Truth was also over-billed, being in fact a manhole cover for Rome's main sewer. All the more appropriate, then. Judith, very good question! I will answer it in my next post. Joni, thanks for your comment and the link to another thoughtful post. There are always temptations for both authors and publishers to make a story better than it really is. Just as some authors have played fast and loose with the truth, sometimes publishers have been willing to put out books without inquiring into them as closely as they should. The same impulse exists in journalism, which is why there's the *mostly* jocular tag, "Too good to check." If the publisher you mention initially took a "too good to check" attitude to the "BS" you alerted them to, nonetheless it sounds like some kind of quality control finally kicked in, if the book in question was never released. Michael, I think it's indisputable that the book business has become more like the movie business--in fact Thomas Whiteside's book THE BLOCKBUSTER COMPLEX was published as far back as 1980 and the trends he spotted have only continued. I can't be sure if that increases the pressure to massage the truth. Authors have been peddling trumped-up stories and sacrificing accuracy to a good yarn since well before blockbuster-itis set in. A slightly different hypothesis might be that part of the problem is not the analogy of publishing to movies, but the actual overlap between them. Movies, partly because of the needs of the form, are far more likely than books to doctor historical fact. Maybe if Pellegrino has been hanging out with screenwriters, that's where he got the idea that taking a real character and putting him somewhere that he never went, witnessing an event that was dramatically potent (but just didn't happen to happen), was an acceptable strategy. In fairness to Pellegrino I should note at this point that he claims to have been duped by his faux eyewitness, rather than having fabricated things himself. That claim is undermined by other inaccuracies and apparent fibs in his personal history, but not yet disproven. Came across this post just today. I'm a scientist, working in genetics/evolution. Checked out Pellegrino's website. It was immediately obvious that Pellegrino (with claims of work on paleontology, antimatter rockets, archeology, etc.) was a total fraud. Any halfway competent scientist would recognize this. So I'm surprised he's gotten away with it this long. I ended up coming across your post because I've been looking into an author published by Simon and Schuster. I discovered that he plagiarized heavily, and has fabricated as well (the plagiarism has now been widely reported, through the fabrication has only received somewhat minimal press attention so far). I tried contacting Simon and Schuster recently, regarding a series of additional quotations that appear likely fabricated. Given the very specific information I provided, I thought they might do some minimal fact checking. But, at least at this point, stonewalling (i.e. no reply) is the only response I’ve gotten. From a couple of articles I've read today (e.g. about the Goodwin plagiarism case), it seems that Simon and Schuster's typical response in such cases is to circle the wagons. Eurytemora, I would not necessarily assume S & S is "circling the wagons" if they have not responded to you. They may be doing their own checking; or, to be honest, if the title is not recently published and not selling very actively, making corrections to it may not be a high priority. If a book has already been proven to be fatally flawed, the contract may have been terminated even though copies are still on bookstore shelves. It's usually not possible to withdraw all printed books from the marketplace once they have been distributed. If it's still an active title, you should get a response. (If you don't, find out what editor is responsible for it and contact that person). The title was published only six months ago, and is actively selling. After receiving no response to my initial e-mail, I directly e-mailed the editor responsible for the book, and again received no reply. I found the following articles online, discussing Simon and Schuster’s handling of plagiarism cases. Simon & Schuster's track record on charges of plagiarism certainly leaves something to be desired. But since I don't know what title you're speaking of or any of the circumstances, I can't really comment further. If there are errors or copyright infringements in the book you're concerned about, I hope you succeed in getting them addressed.